Spent…….That’s the only word I think I can express myself with at the moment, I left every dollar of me out there on that rooftop of Australia over the last couple of days and I’m broke or at least broken! I have run many times along the single tracks of Mount Bogong and Hotham, but nothing can compare to the climbs that the Butcher Country and Wombat Ranges had to dish out! Cherry, the kind lady that gave me the four wheel drive in on Monday morning was a breath of fresh air and boosted my confidence with the upcoming couple of days. It’s great when a local gets on board with what you are doing, laughing and telling you it is great what you are doing! It’s a worry when they do the opposite, laugh at you, and tell you, you’re going to need a lot of luck where you’re going! They know the land and just how much it can take you apart! I was fresh and ready to crank out the next two days, as I waved Cheery off in a cloud of dust. I just started running straight off the bat, no easing in to it; I wanted to wrap this little baby up. Down the mountain side I ran, all the way down to the river, where the trail switched backed crossing it in many places. I seem to be getting used to having soggy feet early on. I filled my Nalgene bladder up for the last time before the trail went, up. A 41% grade, now that’s steep! And people drive four wheel drives up here? I was keeled over at a right angle and having to push hard with my calf’s to generate momentum, this was going to be an interesting morning for my body. But I needed to get on to the top of the ridge, as it was a long haul over the top of it to get to my camp for the night! As always in this part of the country you are rewarded two fold with your efforts. The views never let you down and the camera just doesn’t pick up on the true beauty of the mountains! I cheered as ran over the rooftop on the ridge line; the pain of the climb was worth it! It’s funny how you can be elevated one moment and flat the next wanting it to be all over! It was tiresome running up and down, up and down for hours at a time and not feeling like you’re getting anywhere. The sun was starting to set and I was still a good 16km out from my camp for the night. A kilometre on this type of trail can take you anywhere from a four minutes to an hour depending on the grade. I like to try and cover 10km per hour but this just isn’t possible at the best of times with the steepness and ruggedness of the climbs. Plus I had a full pack with cooking and sleeping gear for my night out. 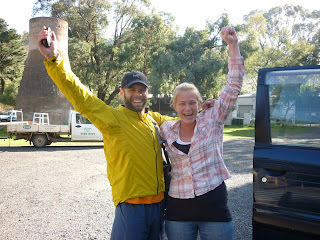 I was so dehydrated and couldn’t get enough water down me, and then there was my final gulp, and my bladder was empty. I had also filled a bottle up which I had in my pack, but I quickly went through this too. The tough part of being on top of a ridge line is there is no water. So my effort to get to camp was even bigger as there was a river there. I pushed on, sweating lot and becoming thirstier. Even the downhills became hard and I slowly started to lose concentration, dehydration as its best! Nothing for km’s later, and then, I saw a trickle of water coming down the track or was I seeing what I wanted to see. I followed the trickle for another km and found it was coming out of a hole in the ground. Jackpot! I dug a big hole with a stick so I could get my bottle in to fill. It was the best feeling chugging down that ice cold water, regardless of the stones and clay that was in it! It was getting pretty dark and cold, so I thought it might be best to settle in for the night as there was access to water and my original camp was another 6km away. I found some soft grass by the side of the track and decided that this was going be home for the night. I got myself fed set up my tent and I was in bed by 7pm. I checked my phone and could you believe it I had a signal, of all the places I had been and all the peaks I had summited and this was the first time I had a signal. Of course I called Vickie for a few loving words and a sense that I wasn’t here, 1500 meters up in the cold and dark alone. 1 minute of chat and it beeped to tell me the battery was flat. Better than nothing I suppose. That was my day over and I lay there with the glow of the half-moon coming through the tent. I tossed and turn all night, I was warm, just couldn’t seem to rest properly. The next time I wake up its 5:15am and I get really comfortable. It’s always the same when you need to get up. So, I’m back to the hole in the ground filling up my water for the day and eating breakfast. I think I was making good time, buts its 7am before I know it and I rush to get a move for the day, knowing I have to make up the 6km from the day before. The road was flat after I got off the spur. Just a highway of dirt track, or so it seemed to me after my day on the ridge. I thought I could try and cover lots of mileage while the track was so open, but of course the BNT always has over ideas and it sent me down an overgrown spur with a sign stating that the track was closed, of course I ignored it and found myself lost in the mass of giant ferns and blackberry bushes, which did nothing for my already cut up legs. I decided to walk up and down the river as it was shrub free, but slippy. I found the track final after about half an hour and it was newly cleared to my surprise. 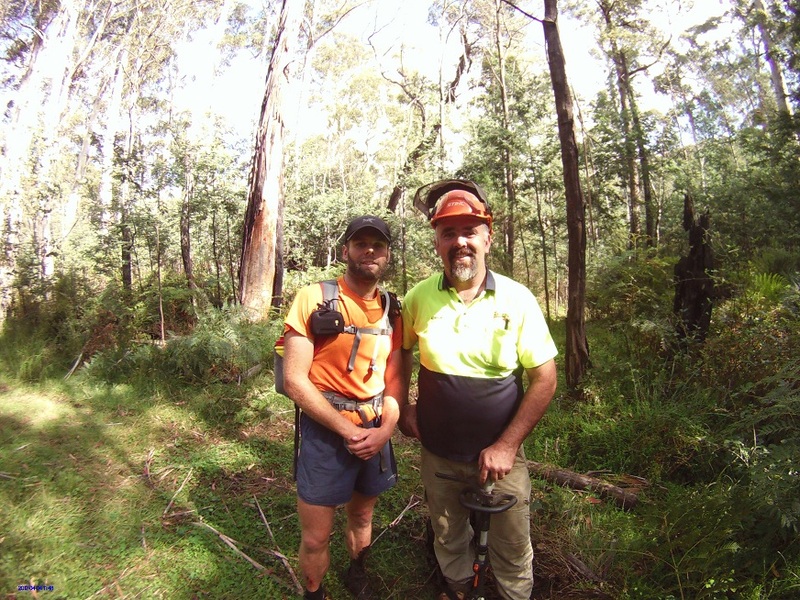 I ran about 2km up the track, before I bumped in to Adrian and his team, they were subcontracted to Parks Victoria and were re-establishing the bush tracks, thanks to them, this section back to the four wheel drive track was a breeze and they had done an excellent job of clearing it. The four wheel track was flat and winded its way through a beautiful valley and again it was time to cover a lot of ground. My legs were throbbing from all the cuts and bruises, but there wasn’t a climb in sight which made me smile! I followed the river for about 10km and some of its crossings were waist deep, but were a great opportunities to fill my bladder, as it was a hot afternoon. I crossed the river for the last time before heading up Wombat Range and then the nightmare killer climbs started all over again! For yet another few hours. I passed a four wheel drive that was stuck early on. It had a trailer on the back and just couldn’t make the climb. Nothing I could do to help, so I wished them luck and bashed up the once again steep ascent. I was 6.8km away from the finish for the day and was running out of daylight. The last spur a needed to come down on was official closed, but once again I ignored the sign and trundled on down, that was until I hit a brick wall of bush and just could pass, and I didn’t want a re-run of Middle Ridge Spur that I got lost on just a couple of day early. I climb back up to the road. Sign said that people traveling along the BNT should take Station Track, but that wasn’t even on the map! The only way I could get back to Vickie was a 20km round trip and that just wasn’t going to be possible at this time of night and the track I need to take was up and down three spurs and I know now from experience that can take hours. But there was no other way; I would just have to run in the dark, I had my head torch after all. 3km in and I’m climbing and hurting, and I little; pissed off that I had to turn 6km in to 20km after running 60km for the day. I hear the sound of a four wheel drive. I decided there and then if it was coming my way I was going to get a lift. Next thing I find myself sitting in the front seat of Tom and Glenda’s four wheel drive, the couple I had passed hours early who were stuck on the spur, they had managed to get themselves free and now where freeing me from the wildness and the 20km round trip in the middle of the night. Luckily I got a phone signal on the way down and enough battery to tell Vickie I would be in Dargo some hour and a half later. In true Australian style we met at the local pub. I was so exhausted I wasn’t even in the mood for a beer and we headed to our camp for the night were I ate lots and filled Vickie in on the adventures of the last couple of days! 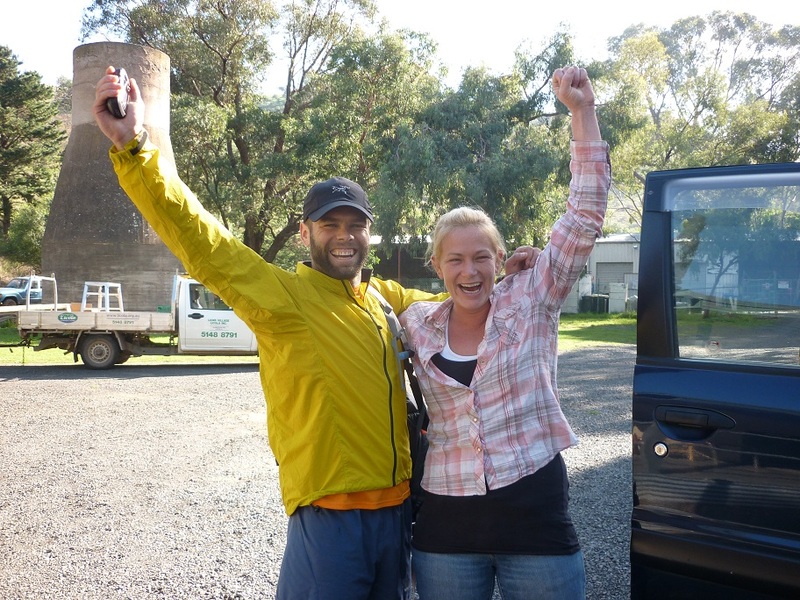 Vickie had sorted out setting up camp outside the Dargo River Inn with Matt the owner. He came over to our place (the Mother Ship) for a chat and brought some ciders to share. I nice bloke who knew everything there is to know about this part of the world. We shared a few stories and had a nice relaxing night, before I zonked out!